The soul has been engaged in the search of God for ages. Like, a thirsty person craves for water. The soul after separating from God is experiencing great suffering. The happiness which was in Purna Brahm’s (SatPurush’s) Satlok (Ritdhaam), that happiness is not present here in Kaal (Brahm) God’s lok, whether someone is a millionaire or the lord of the Earth (King of the whole Earth), or lord of the gods (the king of heaven, Indra), or is lord of the three worlds (Trilokpati), Shri Brahma, Shri Vishnu and Shri Shiv. Because birth, death and the result of the performed deed has to be borne (Evidence: Bhagavad Gita Adhyay 2 Shlok 12, Adhyay 4 Shlok 5). Therefore God (Kaal God), who is the giver of the knowledge of Holy Shrimad Bhagavad Gita, has said in Adhyay 15 Shlok 1 to 4 and Adhyay 18 Shlok 62 that Arjun, go in the refuge of that God in every respect. By only His grace you will attain supreme peace and Satlok (Shaasvatam Sthanm - Eternal Place). I (the giver of knowledge of Bhagavad Gita) do not know the Tattavgyan (true spiritual knowledge) and the path of bhakti of that Parmeshwar. To know about that Tattavgyan, go to Tattavdarshi saints, prostrate before them in reverence and ask them politely, then those Tattavdrshta Saints will tell you the Tattavgyan of Parmeshwar. Then follow the path of bhakti directed by them wholeheartedly (Evidence: Bhagavad Gita Adhyay 4 Shlok 34). 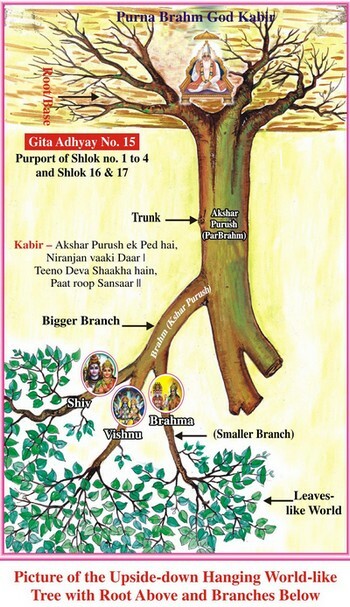 Describing the identity of a Tattavdarshi saint in Bhagavad Gita Adhyay 15 Shlok 1, has said that this world is like an upside-down hung tree, which has roots above and the branches below. He who knows about this world-like tree is a Tattavdarshi Saint. In Bhagavad Gita Adhyay 15 Shlok 2 to 4, has said that, that world-like tree has the branches in the form of the three gunas (Rajgun-Brahma, Satgun-Vishnu and Tamgun-Shiv), which are extended in the three loks (Heaven, Nether World and Earth) above and below. I will not be able to tell about that upsidedown hung tree of the world i.e. about the nature’s creation in this knowledge of Gita Ji. Here in this discussion (knowledge of Gita), the knowledge which I am telling you, this is not complete knowledge. For that, has indicated in Gita Adhyay 4 Shlok 34, in which has said that for complete knowledge (Tattav Gyan), go to Tattavdarshi saints; only they will tell. I do not have full knowledge. Kaal has said in Gita Adhyay 15 Shlok 4 that after finding a Tattavdarshi saint, one should search for that Param Pad of Parmeshwar (Supreme state of the Supreme God, about whom has mentioned in Gita Adhyay 18 Shlok 62). Having gone where, a worshipper does not return again i.e. attains complete liberation. The Purna Parmatma from whom the upside-down tree of world has extended; meaning is that the Parmeshwar who has created all the brahmands. And I (the giver of the knowledge of Gita, Brahm) am also in the refuge of that same Aadi Purush Parmeshwar i.e. Purna Parmatma. By doing His sadhna, one attains Anaadi Moksh / Eternal Salvation (complete liberation). Evidence is in Bhagavad Gita Adhyay 15 Shlok 16, 17 and in Adhyay 8 Shlok 3, which is an answer to Adhyay 8 Shlok 1 that He is Param Akshar Brahm and one more evidence of the three Gods is Gita Adhyay 7 Shlok 25, in which Kaal (Brahm), the giver of the knowledge of Bhagavad Gita, has said about himself that I am unmanifested/ invisible. This is the First Unmanifested God. Then in Bhagavad Gita Adhyay 8 Shlok 18 has said that this world has originated from the unmanifested (ParBrahm) during the daytime. Then at night, vanishes into him only. This is Second Unmanifested. Kaal (Brahm) has said in Bhagavad Adhyay 8 Shlok 20 that apart from that unmanifested (ParBrahm), He who is another unmanifested (Purna Brahm), that Param Divya Purush, even after the destruction of all the living beings, does not get destroyed. This very evidence is also in Bhagavad Gita Adhyay 2 Shlok 17 that know that God to be imperishable, whom nobody is capable of destroying. God, the giver of the knowledge of Gita (Brahm), has said about himself in Adhyay 4 Mantra 5 and Adhyay 2 Shlok 12 that I am in birth and death i.e. I am perishable. Only he is a Tattavdarshi Saint who gives full knowledge about the world-like tree i.e. of nature. Like, the base (root) of the abovementioned tree of world is Param Akshar Purush i.e. 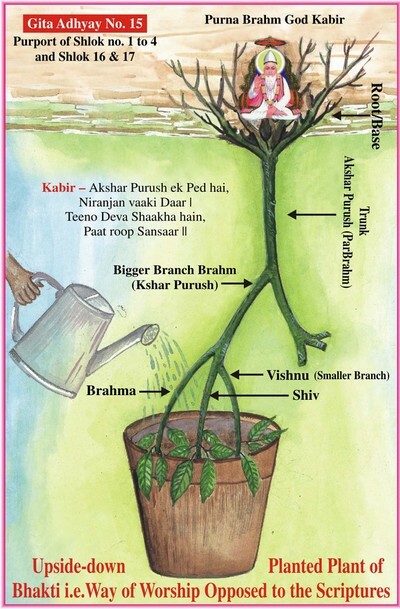 Purna Brahm KavirDev (God Kabir). This only is called the Third Unmanifested God. The whole tree receives nutrition from the root of the tree. Therefore has said in Bhagavad Gita Adhyay 15 Shlok 17 that in reality, Parmatma is someone else other than Kshar Purush i.e. Brahm and Akshar Purush i.e. ParBrahm; who entering into the three loks, nurtures and sustains everyone. He only is Imperishable/eternal in reality. 2. The meaning of Akshar is Imperishable. Here even ParBrahm has been called as permanent i.e. imperishable, but in reality even he is not imperishable. Like, there is a cup of porcelain, which is white in colour and used for drinking tea. It breaks as soon as it falls. Know this to be the state of Brahm (Kaal i.e. Kshar Brahm). Second cup is of steel. It appears to be more durable (imperishable) than the cup of porcelain, but it also rusts and gets destroyed, though it may take a long time. Therefore, in reality, even this is not imperishable. The third cup is of gold. The metal ‘gold’ is actually imperishable, which does not get destroyed. Like, ParBrahm (Akshar Purush) is also called Imperishable and in reality Imperishable is someone else other than these two; therefore, Akshar Purush is also not Imperishable. Reason — After the death of seven Rajgun Brahma, there is death of one Satgun Vishnu. After the death of seven Satgun Vishnu, there is death of one Tamogun Shiv. When Tamogun Shiv has died seventy thousand times, then there is death of one Kshar Purush (Brahm). This is one yug of ParBrahm (Akshar Purush). One thousand such yugas make one day of ParBrahm and the night is of the same duration. Thirty days-nights make one month, twelve months make a year and ParBrahm’s (Akshar Purush) age is 100 years. Then this ParBrahm and all the brahmands, which are below Satlok, become destroyed. After some time, Purna Brahm i.e. Param Akshar Brahm creates all the lower brahmands (loks of Brahm and ParBrahm). In this way, we have to understand this Tattavgyan. But Param Akshar Purush i.e. Purna Brahm (SatPurush) and along with His Satlok (Ritdhaam), the upper Alakh lok, Agam lok and Anami lok never get destroyed. Therefore in Bhagavad Gita Adhyay 15 Shlok 17, it is said that in reality the Supreme God i.e. Purushottam is, however, someone else other than than Brahm (Kshar Purush) and ParBrahm (Akshar Purush), who is Purna Brahm (Param Akshar Purush). He only is Imperishable/Eternal, in reality. He only, the nurturer and sustainer of all, is the root-like Purna Parmatma of the tree of the world. The part of the tree which is visible immediately above the ground is called trunk. Consider it to be Akshar Purush (ParBrahm). The trunk also receives nutrition from the base (root). Then beyond the trunk there are many branches of the tree. 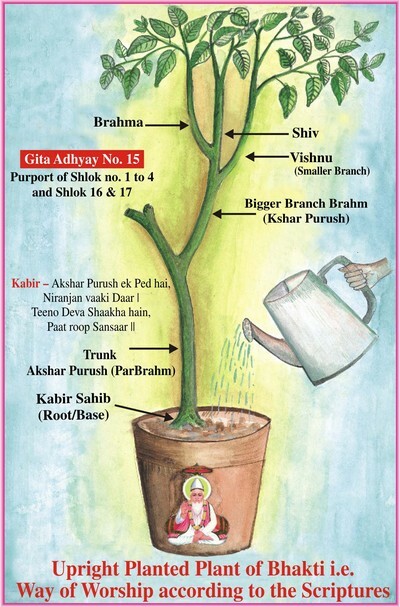 Of them, one bigger branch is Brahm (Kshar Purush). This also receives nutrition from the base (root) i.e. Param Akshar Purush / Purna Brahm. Consider that bigger branch (Kshar Purush / Brahm) to have three gunas-(Rajgun- Brahma, Satgun-Vishnu and Tamgun-Shiv)-like smaller branches. These also obtain nutrition from the root (Param Akshar Purush i.e. Purna Brahm) only. The other living beings in the form of leaves are dependant on these three smaller branches. They also, in reality, obtain nutrition from the root (Param Akshar Purush i.e. Purna Brahm) only. Therefore it has been proved that Purna Parmatma only is worthy of being worshipped by everyone. This can also not be said that in supplying the nutrition to the leaves, the trunk, bigger branch and the smaller branches do not have any contribution. Therefore all are respectable, but worshippable is only the base (root). There is a difference between worship and respect. For example, a wife, who is loyal to her husband, shows respect to everyone; like, to elder brother-in-law like an elder brother, to younger brother-in-law like a younger brother, but only worships her husband; which means the feelings a loyal wife has for her husband, she can not have for another man. Second example: - Once, Haryana state was hit by flood. At that time, a loss of 600 crore rupees was incurred. The Haryana government could not compensate the loss because the budget of the Haryana government for the whole year was only 900 crore rupees. The prime minister of the country had compensated for it. The distribution of those six hundred crore rupees was done by the officials and workers of the Haryana government. Those who receive aid, who are ignorant, they consider the distributers only to be the giver of the aid. They keep worshipping (bribing etc) them. But those who are educated, they know how much contribution these workers have. They show respect to them, but do not worship (bribe) them. Nor do they expect accomplishment of any other task by them. After the distribution of the flood relief money, the minister of the state visited that place. He said that I gave ten lakh rupees to your area and read names from the list of that same village. 1. Gave ten thousand rupees to Ramavtar ……. etc. Then the Chief Minister of the state visited that same village. He also read the same list and said that I gave ten lakh rupees to your village. 1. Gave ten thousand rupees to Ramavtar……..etc. The Prime Minister of the country came in the same village. He also said that I gave ten lakh rupees to your village and read the same list, in which it was written 1. Gave ten thousand rupees to Ramavtar. Ramavtar is saying all these are lying. The Registrar gave me the money. That ignorant Ramavtar, out of ignorance, by only worshipping the Registrar of the village, wishes his all other tasks to get accomplished. Those who are educated, they understand that had the Prime Minister not given the aid, the chief minister, minister and the registrar could not give anything. If the chief minister had distributed money from his relief fund, he would have been able to give hundred rupees each with difficulty to those affected by flood, which would have been nominal. In this way, a wise man understands what capability one has, and based on that only, has faith in them. Nobody is unrespectable, but for the sake of worship he makes a selection discreetly. Similarly, in Gita Adhyay 2 Shlok 46, has said that after attainment of a very large reservoir of water (whose water will not end even if it does not rain for ten years), the faith which is left in a small reservoir of water (whose water ends if it does not rain for a year); after becoming aquainted with the knowledge of the benefit obtained from Purna Parmatma you will have same faith left in the other gods. That small reservoir of water does not appear bad, but we know its capacity, that it is a makeshift. In Bhagavad Gita Adhyay 7 Shlok 12 to 15, has said that whatever is happening from the three gunas (like, production of living beings from Rajgun-Brahma, preservation from Satgun-Vishnu and destruction from Tamgun-Shiv), I (Brahm/Kaal) only am the main cause of it. Those worshippers who worship the three gunas (Rajgun- Brahma, Satgun-Vishnu, Tamgun-Shiv), they, with demoniac nature, the lowest among men, the evil-doers, fools, do not even do my, Brahm’s, bhakti. Then has called his bhakti as very bad/inferior (anuttamam) in Gita Adhyay 7 Shlok 18. That is why, it has been said in Gita Adhyay 15 Shlok 4 and Adhyay 18 Shlok 62 that only by doing bhakti of the Purna Parmatma, full benefit – complete liberation is attained, which is scripture-based bhakti, and the sadhna of the other gods as deity, because of being against the scriptures, is useless (evidence in Bhagavad Gita Adhyay 16 Shlok 23, 24). The meaning is that if a worshipper does sadhna (worship) of Purna Parmatma (root) regarding Him as the deity, then the trio, Brahma, Vishnu and Shiv (smaller branches), only will provide its result to him. Because these gods give the result of the actions performed as it is. If you have to attain a job in a company, then you have to worship the owner of the company (factory). You have to request him through an application form to attain a job. One does service (worship) of the owner only. Like, whatever task is given to that servant he does it during his working hours. This is worship (service) of the owner. The wages of the service (worship) are given by another servant (worker or an officer) of that owner. Like, a shift officer based on the attendance calculates the wages (the reward of the work done) and sends it to the cashier. From there that servant receives the reward of his service (worship). Shift officer and the cashier only give the work done. They can not make any changes in it. Neither can they give a Rupee extra, nor can deduct it. If that servant (worshipper) of the owner of the company does service (worship) of the owner with honesty, then that owner only increases the wages of that servant and as an adjunct gives extra money as a reward. If someone giving up the service (worship) of the owner, starts doing service (worship) of other officers, then he stops getting the reward of money from the owner. Because of which that fool becomes poor. The officers can not remunerate him equally. Because of getting very less facilities compared to those given by the factory owner that servant of the other officers, i.e. a person who relinquishing one master worships others, becomes highly distressed. Please understand the knowledge of Holy Shrimad Bhagavad Gita Ji on the basis of Tattavgyan in this manner. By abandoning the worship of Purna Brahm, the Master of the lineage and by doing the worship of other gods, a worshipper does not obtain full benefit and the worshipper even while doing sadhna keeps experiencing intense sufferings.